In a recent article Opportunities in the Current Market, Van and I wrote about how the Central Banks’ policies were laying the groundwork for long term volatility and extended currency trends. In this context, how can traders view the recent Swiss National Bank (SNB) release of its currency’s peg to the EUR? In an early retrospect of that action, I believe this action will be seen as the “starting signal” for an extended period of consistent FX trends. That is, Forex will be a very attractive trading environment for the years to come. Meanwhile, however, the SNB move also reminds traders that managing their risks should remain the primary goal of trading. Traditionally, the Swiss Franc (CHF or Swissy) has long been seen as a safe harbor for international capital in times of turbulence. Capital started moving into CHF during the Global Financial Crisis in 2008 and that flow became a strong trend over the years since. In this period, the EURCHF was a great pair to trade short but the more the Swissy strengthened, the more the large exporting portion of Swiss economy suffered. In the summer of 2011, the SNB decided to peg the CHF to the EUR at a minimum rate of 1.2000. How can such a peg be operationalized in practical terms when the currencies are openly traded in the market? Well, the SNB had to create new Swiss francs (ie by “printing” money) so that they could be sold in the market by buying Euros. This naturally led to a devaluation of the CHF against the EUR, establishing the peg. In order to be effective, however, the SNB had to continue this sell-CHF/buy-EUR process on a frequent basis. For a number of years in my workshops, I have been saying that no Central Bank in the world can intervene against the free markets in the long run. During the three years of the peg, the SNB had to spend more than 300bn USD to maintain the target exchange rate. For a small country like Switzerland, the mounting costs (and monetary risks) became unbearable. As a result, on January 15th, the SNB decided to unpeg the Swissy from the Euro and the market had to find a new natural equilibrium. 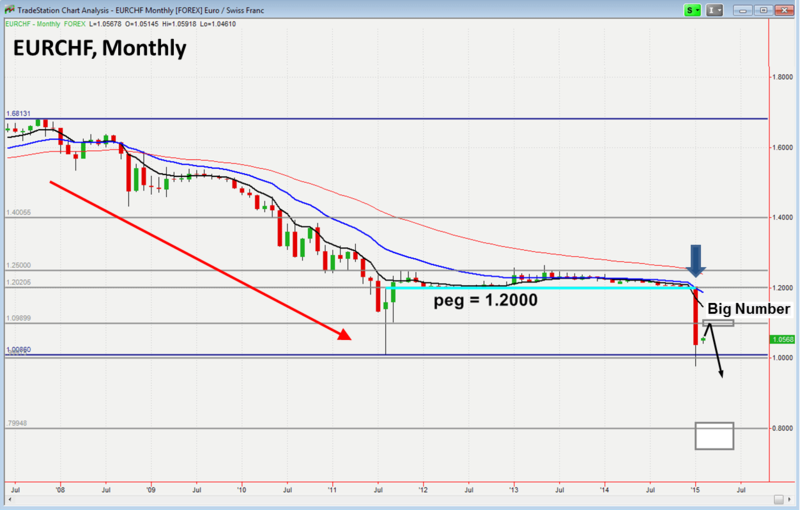 The EURCHF found that the balance after it dropped around 20%. That drop hurt many people positioned on the wrong side of the market. Whereas the SNB itself had to cover losses of around 80bn USD, the Swiss equities index dropped by around 10% with more considerable losses in the prices of companies with significant export based revenues. This event should act as a strong reminder for traders to focus on risks and let the market decide when to grant profits. Could the SNB action have been foreseen? Yes and rather obviously – no market actor (even a central bank) is stronger than free market forces in the long-term. The timing on this decision, though, was a surprise and in the markets, surprises can bring a heavy cost. A few of the consequences were – a hedge fund liquidation (Everest Capital), the insolvency of Alpari (a UK spread-betting broker) as well as some heavy stock price losses for FXCM (a US based FX broker). Stock traders experience price gaps on a regular basis but in the currency market, they are extremely rare. Bear in mind, even the suddenness of the Fukushima Tsunami in Japan did not cause a gap in the Yen. The CHF peg, however, was an exceptional situation: something I would call the Central Bank trap. The SNB had become the only seller of CHF in a market that had already dried up considerably (due to the peg). Once the decision to unpeg occurred, everybody knew that the SNB had a problem (the trap) and liquidity anywhere close to the peg level dried up even further. Obviously, nobody was prepared to sell the Swissy but only buy it at a much higher level, thus the market gap occurred. I like to look at what the charts tell me without being biased by outside opinion – actually I tend to ignore news opinion and good advice. Below, the monthly chart of the EURCHF shows a clear downtrend since the middle of 2008. You can clearly see the official peg at 1.2000 (the horizontal turquoise line) where the SNB kept the EUR exchange rate through frequent interventions. For more than 3 years, the peg helped create a tight and precise consolidation pattern respecting moving average lines (8 period EMA in black and 21 period EMA in blue). The large red January candle under the arrow clearly shows the breakout after the dissolution of the peg. This chart pattern is a standard short setup identified by my System #2 – the “Flat-Level Breakout”. The system provides a price target at 0.8000 (the rectangle in the lower right) that should be achieved in the next 12-18 months. Currently, a healthy pullback is developing towards the Big Number 1.1000 (the upper thin rectangle). Once achieved, this location might offer a good opportunity to join the newly re-established downtrend on its way to the target. During the peg, the EURCHF offered a huge downside potential with only a limited upside risk. Was the CHF unpeg a tradable pattern of System 2? Would it have been possible and advisable to do so? The answers to these questions (yes and perhaps) are not as simple as they might seem. Trying to make such a trade would have depended on individual goals, the time horizon, and the instrument. The biggest unknown of all for such a trade, however, was the timing of the unpeg. That aspect would have played a critical role in any trade because the right call for the timing would have to have been paired with the right Forex instrument for any hope of success. Van likes to point out that there is “one bullet in the market that has your name on it” and one of your jobs is to avoid allowing it to find you. Trading a pegged currency against the market with leverage is generally a poor idea: the small profits from going Long the EURCHF were countered by a huge potential downside risk. Some market actors got hit last month with the bullet Van talks about. Having learned from making many trading mistakes myself, I have always told my workshop attendees over the years that applying several practical safeguards in risk management only makes sense. For one thing, there is no need to keep all your trading capital in your brokerage account – usually 30% of the full amount can be sufficient to trade well. Also, using leverage of 1:20 or less is sufficient enough to make good returns trading currencies – there is no need to leverage 1:400 as some brokers advertise. Second, the MF Global bankruptcy shows how important broker selection is. Brokers should keep your account funds segregated from its balance sheet. Any brokerage that dodges this standard industry practice should be eliminated from your selection pool. Appreciate your broker as a business partner – look for good service & competence rather than for the lowest transaction costs. More than anything, you want your money to remain safe and secure. I believe the SNB’s recent action was only the starting point for a new phase in the currency markets. We are likely to see continued longer term volatility in the major currency pairs because of the increasingly competitive monetary policies of the major Central Banks. With CHF now converting freely again, Forex traders have more trading opportunities with one more liquid currency – an important factor with the increased volatility. Well prepared Forex traders can look forward to a great period of trading opportunities in the coming years. Equity traders and markets – I’m not so sure about.